The final day of 2014 is upon us. We have mere hours before we become our perfect 2015 selves. No more sleeping late, eating that tenth cookie, or waiting until 4:00 p.m. to shower on the weekends. As I type this, I’m stuffing my face with Christmas toffee, but tomorrow my 2015 self will crave only carrots and baby spinach. Okay, so maybe that will never happen, but Johnny and I are still excited for a new year to try to be just a little bit better. Save 50% of our net income. 2014 may have been one of our craziest years yet, but somehow we still managed to keep our budget in check and meet this goal. Be glad you didn’t see Johnny and me awkwardly high fiving each other earlier. Work smarter, not harder on OFB. Hmm… I’d give us a bright red FAIL on this one in 2014. But with our site redesign and some other planning and organization we’ve been working on, I think we’ll (hopefully) have this nailed down in 2015. Take advantage of the outdoors. Ding, ding, ding! We have a winner! From Zion to Arches to everywhere in between, we did more hiking last year than in all our other years of marriage combined. Plan vacation time more purposefully. We did better with mini vacations this year, but we still never dropped everything for a week in the sand and sun — which was our goal. With baby #2 on the way, if we even get out of the house in 2015, I’ll be feeling real good. Put ME first. The first half of this year was a pretty selfish one for me. I quit my job, got into great post-baby shape finally, and got my groove back. 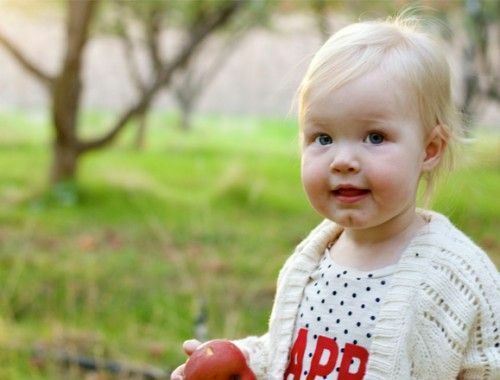 Once August hit, I started growing another human, entered the terrible twos a few months early with Sally, and moved to a new city. But that’s what life is all about, so we’ll still call it a win. Go to sleep earlier. Yeah, this is never going to happen. Stay within our grocery budget. I worked on our grocery budget every month, but admittedly I still went over several months this year. That said, it wasn’t over by very much, and I’m especially determined to do better in 2015 now that we’re in a city where $5.00 milk is the norm. Be better prepared for a zombie apocalypse. Or an earthquake. Or power outage. Or whatever terrifying scenario. Johnny passed this with flying colors, thanks to our preparedness month back in October. Zombies, we’re coming for YOU. Rock climbing. For real. Another pass. What an overachiever. We took a rock climbing class together in March, and Johnny’s been climbing regularly ever since. Read 12 books. Per my recommendation, Johnny finally read Ready Player One and Mockingjay, thanks to all his long flights to NYC earlier this year. And he read a few business-y books as well, but his quota was closer to 6 than 12. Maybe he’ll hit this goal in 2015 with his 30-minute subway commute each morning. Wake up earlier. Until we figure out the going-to-sleep-earlier thing, this one is never gonna happen. Then again, newborns have a way of changing things, like it or not :). Save 50% of our net income. We’re going for round two on this baby, which will prove to be more of a challenge now that we’re living in NYC. Someday when we buy a house, we’d love to be able to put down a hefty downpayment without depleting our savings completely. We also plan to max out our Roth IRAs again this year, so optimizing our savings would help with this, too. Get out of NYC every other month. If we’re going to stay sane with two children in Manhattan, this is a must. Since we probably won’t be taking any huge vacations this year, we’re hoping to take several road trips to wide open spaces. Track our budget near-perfectly. Our tracking is going to have to be consistent each and every month this year. Now that we’re in NYC where everything is marked up, we can’t just go on our gut instincts with our regular spending. Even chain restaurants we frequent like Five Guys and Chipotle are significantly more expensive. 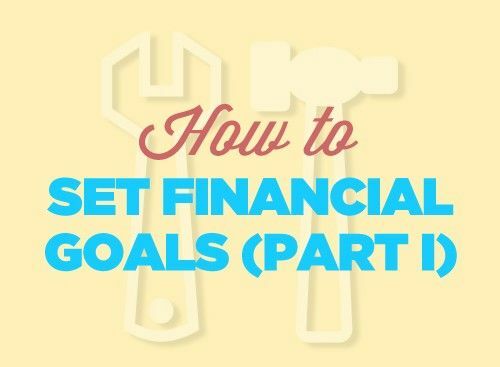 We’ll have to track our budget to a T if we’re going to hit our savings goals. Potty train Sally before the baby comes. This may be a total bust, but we’re going to try it. And if we fail, at the very least we plan to teach her to change all the new baby’s diapers. Only kidding… kind of. Lose the baby weight. Yep, I’m already thinking about getting back in shape 14 weeks out from delivery. It took a while after Sally, but I did it, and I’m hoping to do it again with baby #2. And what better incentive to take advantage of Central Park and Riverside Park and start running again, just like old times? Quit playing catch up. I feel like I spent all of 2014 with a to-do list I could never quite keep up with. I was always behind on something (and still am). I’m hoping with some better time management and organization, I can finally catch up in 2015. Contribute to our side income more consistently. Since I quit my job last May, my monetary contributions to the family income have been sporadic. We have a plan to remedy this in 2015 (namely getting a few hours/week of part-time help with Sally), but we’ll see if I actually have the nerve to follow through with it. Be content with myself. One aspect of living in NYC that I struggled with when we lived here last time was the pressure to be more and better. In a city of overachievers, it can be a good feeling to be motivated to be better, but it can also be overwhelming. I’m hoping this time around to avoid comparing myself to my fellow New Yorkers. Work out every day. I know, I know, super cliche. But this year it’s going to be different. Know why? The Scientific 7-Minute Workout. I don’t do conventional “working out” for two reasons: it’s boring (hence why I rock climb) and it takes a long time. Now with this handy app, a wall, a chair, and two minutes shy of a Lynyrd Skynyrd “Freebird” sesh, I’m getting fit. Because science. Take advantage of NYC. I forgot how great this city is. It’s the energy. You’re surrounded by so many people, many of whom are far more talented and successful than you’ll ever be. I want to network and learn from those people. I want to see and experience more of what people from around the globe travel to this city to do. I want to live each day consciously out here. I also never want to use the phrase “live consciously” ever again. Listen to podcasts on commute. I’ve got a 34-minute commute to work every morning and night. After recently getting a belated introduction to how cool podcasts are (yes, it was Serial), I’m determined to maximize my commute time listening to business, blogging, and financial podcasts to soak up more knowledge instead of Taylor Swift lyrics…which presumes I even listen to her. Which I don’t. Sometimes. Increase side income every month. I’m always looking for the next hustle or idea, but it’s rarely tied to a specific or measurable purpose. No longer. The benchmark is now going to be to make a little more than the month prior. At some point (like maybe when a second little human enters our lives? ), I’ll run out of extra time to make that extra dough which will mean working smarter, not harder. Here’s a chance at a 2014 goal redemption. So there are our resolutions, listed publicly for better or for worse. So what’s your #1 resolution for 2015 — financial or otherwise? Let’s be accountable (and miserable at the end of 2015) together! So much motivation! 2015 I’m coming for you!!! That’s right! 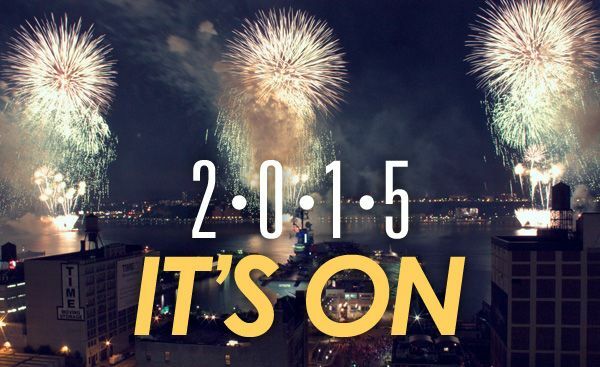 2015 is the year that beats all others! My #1 resolution is to pay of $30,000 in debt! I’ve broken that down into smaller goals, but that’s what we’re working towards. Also, I’m loving the 7-minute workout idea – goes great with the free email course I’ve written that starts on the 5th! That’s a great resolution! I hope you guys blow it out of the water! 7 min workout. I’m in! It’s already begun in our house… I’m not in, but maybe I will be come April! My one and only resolution: FINALLY pay off $13000 in consumer debt. It won’t be easy, but if I stick to the plan I can totally do it. Right?!?! Lol. Yessss!! Having a plan is key. You can do it… 2015 is the year! Looks like I’m not the only one focused on debt for the upcoming year! 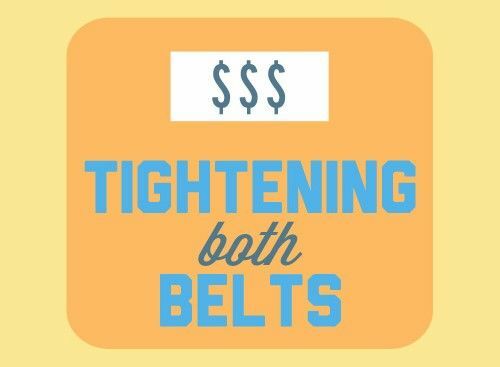 The last 6 months of marriage said goodbye to all private debt–around $5500. The goal for next year is to focus on student loan debt, up the ante a bit, and demolish two loans (a total of about $13000). Our secondary financial goal is to add to savings. No specific amount, but I’d like to end with more money than we have there now. We have been saving for a big honeymoon/one year anniversary trip, and I don’t want to decimate our savings with that trip. So, we will focus on trying to pay for hotel/plane tickets/rental car out of our monthly budget rather than dipping into that savings. Other goals include the standard weight loss, and finding contentment with what I have, particularly through spiritual growth. Way to go on paying off your private debt! Just take one day at a time, and you’ll have the student loan debt wiped out, too. It sounds like you’ve got some great goals for 2015! Here’s to our best years yet, amiright?! Podcasts COMPLETELY changed the way I looked at my work commute. Right now, I’m a 30-45 minute morning commute depending on traffic, and a solid hour on the way home. I love using that time for personal development (sometimes entertainment) with podcasts! Johnny’s hooked! Every day he has a new one I need to start listening to! Awesome. 15 for 20 is impressive! Boring but important goals are the very best kind. I’ll have Johnny share his favorite podcasts soon! Haha, you guys are hilarious! Good job in writing up your resolutions and sharing them with the world. I need to actually set some goals this year. Maybe for today it’ll just be to get through 2014. I love all your resolutions! Mine are similar… Finish losing the baby weight from #2, corral the grocery budget, save more $. And listen to podcasts on my runs! Another big one for our family is to take a legit vacation just the 4 of us… Nothing huge- maybe a week at Cape Cod or something. Also, you guys should definitely check out the Finger Lakes on one of your vacate-NYC trips! It’s so beautiful here! Lots of hiking too, and with a completely different landscape than what you saw in Utah. YES. We need a legit vacation, too. Funny how hard that is to accomplish once kids enter the picture and life gets crazy! We’ve added the Finger Lakes as a place to visit sometime this year. Thanks for the rec! Great resolutions! Mine will be similar to this past year with a huge focus on saving for a down payment to BUY a HOUSE in 2015! It will be a stretch, especially if prices continue to climb in Los Angeles, but I’m digging in my heels and making it happen. How fun! I hope you make it happen. Happy house hunting! Ready Player One was recommended to me by my mom! It is an awesome book. You two are such an amazing example of a couple working well together. I hope that I work that well with my spouse when I get married (still imaginary-don’t judge). Thanks, Michelle! Take it from me, imaginary spouses are a lot easier to work with! 😉 But seriously, based on the noggin on your head, you’re gonna do just fine in that department! I love reading others’ resolutions. I actually share your one about being content. I’m thinking that hanging out less on Instagram would probably help with that. We also have some big financial goals right now. At the moment they seem pretty much impossible, but it’s always good to aim high, right? I’d also love a post on the podcasts you find. I’ve enjoyed the ones from YNAB, but I need some more. Yup… I like the way you think. Aiming high is the only place to aim, IMO! I’ll have Johnny compile a list of his favorite podcasts soon! Can you please share more about saving 50% of your net income? Do you follow a budget? How do you accomplish this? Also what savings routes do you use to store or invest this money? I would appreciate your response. Good questions! We’ll be sharing our 2015 budget next week, which should lend some insight. We also have some posts specifically about how we budget, which you can find in our Financial Guides section at the top of the page. Hope that helps! Feel free to email us via the Contact Us page if you have any other questions! I love that all your 2015 goals are all achievable. This year I have create some goals that I’m not totally sure that I can achieve, but I’m sure gonna try. I agree with getting more sleep. I know I need to sleep a lot more than I do. Good luck with your 2015 goals and I look forward to following you on your journey. I don’t think it’s a bad idea to have a few goals that are at least a little far fetched. It helps you to try harder than you normally would! You guys should try Oh Crap Potty Training – it’s great! I’ve got the book (pdf actually – you buy it at her website) and am actually looking forward to toilet training our twins now. Our friends all swear by it. Enjoy NYC – I miss it! I’ll look into it right away! I’ve been needing a good potty training resource to look toward. Thanks for telling us about it! This question is aimed toward Johnny. What financial podcasts do you plan to listen to? I decided to do the same wr hat least an hour commute twice a day! Great question, Jason. For financial/business-related podcasts, I’m digging Listen Money Matters, Smart Passive Income, and The Fizzle Show. But most of my time has been sucked away by StartUp and Reply All this week. Less financial, but supppper fun and interesting if you haven’t given those a spin.